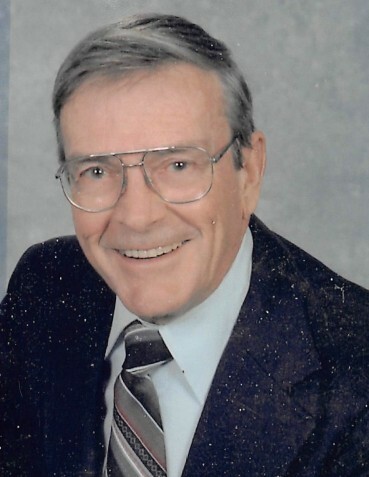 George L. Shaffer,age 90, passed away Friday, July 20, 2018 at Bell Gardens Place in Hillsboro, OH. He was born May 11, 1928 in Carnegie, PA, son of the late George Leslie Shaffer Sr. and Nellie Elizabeth Shaffer. George was a member of the New Vienna and Hillsboro Lions Clubs, the Auburn 1st United Methodist Church, and was a life long ham radio operator. For over 30 years, Mr. Shaffer taught mathematics and physics at the high school and college level. George and his wife Imogene loved to travel, having visited many places all over the world. Surviving are wife, Imogene Shaffer, whom he married August 18, 1950, three daughters, Linda (James Daniels) Chamblin, Janice (Timothy) Hughes and Leslie (Mark) Holmes. Also surviving are eight grandchildren, Robert Chamblin, Toni Lewis, Jessica Chamblin, Tim Martin, Evan Hughes, Adam Hughes, Ian Holmes, Aidan Holmes, seven great grandchildren, and his sister, Marie Rose Bibbee. According to his wishes the family will celebrate George's life with a private memorial service held at a later date. The Rhoads-Edgington Funeral Home, Hillsboro, is serving the family. If desired, memorial contributions may be made to Hospice of Hope, 215 Hughes Blvd. Mt. Orab, OH 45154 or Auburn First United Methodist Church c/o Ed Bates 9944 Graybill Rd.. New Vienna, OH 45159 .